WILLEMSTAD - In 2017, the development of the gross domestic product (GDP) will result in a further decrease compared to the previous year. The first preliminary calculations with regard to economic development in Curaçao indicate that there is a decrease of 1.7 percent, a stronger economic decline than in 2016 (-1%). The percentages relate to real developments, that is to say, that they have been adjusted for price developments. This is evident from the data that the Central Bureau for Statistics Curaçao (CBS) has published. Economic growth is calculated on the basis of volume growth in the production process and the economic development. This data is still provisional because complete data from all branches of industry cannot yet be obtained. The economic indicators are statistics that indicate the current status of a country's economy, depending on a certain area of the economy (such as industry, employment, trade, etc.). 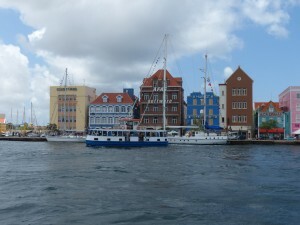 The trend of economic stagnation or even regression, which in recent years is characteristic of Curaçao, is accompanied by high unemployment. In the year 2017 there was an increase in unemployment of 14.1 percent, a youth unemployment rate of 32.8 percent, a low economic activity and a cautious spending inclination among consumers, which is influenced by inflation of 1.6 percent. For non-financial corporations, the real growth of economic activities in 2017 was mainly in the industries: "Non-Residential Industry" (3.6%), and "Construction" (0.1%). There is also economic growth in the "Government" sector (1.1%). The utility industry shows an increase of almost 4 percent in 2017. In this industry an increase in the volume activities of both water and electricity has been observed. Furthermore, the price component for water has dropped by almost 1 percent. There was a slight improvement in construction. This positive performance can be attributed to, among other things, the construction of the new mega pier, the new hospital and various small construction projects. In 2017, the provisional added value of the government activities increased. The contribution of government activities to economic development in 2017 increased more than in 2016. Furthermore, the decline in economic activity in 2017 occurred mainly in the industries: "Agriculture, fisheries and mining" (-1.9%), "Industry" (-3.5%), "Trade" (-4.6%) , Hotels and restaurants (-1.4%), Transport & Communications (-2.6%), Business services (-5.4%), Education (-1.5%), "Health care" (-0.8%), and "Other services" (-5.5%). There is also a decrease in the sector "Financial intermediation" (-2.6%). The added value of "Agriculture, fisheries and mining" fell by 1.9 percent (in 2017), while in the previous year there was a growth of more than 2 percent. With a decline of 3.5 percent, activities in the industrial sector continue to decline, including oil refining activities. The activities in the "Trade" sector decreased by more than 4 percent in 2017, identical to the previous year. This was caused by a decrease in goods imports and by the various trading activities of the companies. The tourism sector is still in a difficult period. In 2017, the activities in the "Hotels and restaurants" sector declined further compared to the year 2016. A global overview of the number of overnight stays of tourists from the various tourist regions shows that there has been a decline with the exception of Europe (3 %) and North America (7%). Of all regions, the Caribbean is the most deteriorated by 19 percent, due to less direct air connectivity in the region. The number of tourist overnight stays from South America continues to decline, although the decline of 17 percent in 2017 is less than in 2016 (-25%). The number of overnight stays from "other areas" has improved by 36 percent. Both the total number of overnight stays of tourists and the total number of visitors or tourists decreased in 2017 by 1 and 10 percent respectively. All in all, these developments result in a lower added value of the "Hotels and restaurants" sector of more than 1 percent. The downward trend in the "Transport & communication" industry will continue in 2017, with a decline of nearly 3 percent in economic activities. In transport, activities in the port and airport have declined. The port activities fell mainly due to the decline in pilot ships, with the exception of cruise calls and passengers in 2017. Air transport activities also decreased, namely with regard to numbers of passengers, landings and airfreight. Furthermore, a decrease in the real economic value of the activities is also observed in the "Communication" sector in 2017. The "business services", which include real estate and letting, have experienced a significant decrease of 5.4 percent in 2017. A decrease in financial intermediation (-2.6%) has been observed in the "Financial enterprises" sector. This decrease can be attributed to a decline in loans, international business and financial services and local commercial banking activities. The "Households and non-profit institutions for households" sector show a slight decrease of 0.4 percent in 2017. In 2017 the world economy grew by 3.8 percent, as shown by the World Economic Outlook of the International Monetary Fund. In 2017 the world economy grew even slightly more than in the previous year 2016 (3.2%). The developed economies indicate an average growth of 2.3 percent in 2017, in 2016 it was 1.7 percent. The growth was mainly influenced by the United States (2.3%) and the Eurozone (2.3%), with the Dutch economy experiencing an increase of 3.1%. Also worth mentioning are the economic growth figures for 2017 in the United Kingdom (1.8%), Canada (3.0%), and Japan (1.7%). The emerging and developing economies grew by 4.8 percent in 2017. This continues the growing trend of these economies, with even higher growth rates than in the previous year 2016 (4.4%). The economies of Asia as a whole have grown by 5.7 percent. In 2017, the economic development of South America shows an average decrease of 0.7 percent, while the economies of Central America show an average increase of 3.7 percent. The economies of the Caribbean region show an average real growth of 2.7 percent in 2017, slightly lower than the real growth of 3.4% in 2016. Unfortunately, the economic development in Curaçao is lagging behind in 2017, compared to the average economic development of the Caribbean region and the rest of the world.